The production of secondary metabolites with antibiotic properties is a common characteristic to entomopathogenic bacteria Xenorhabdus spp. These metabolites not only have diverse chemical structures but also have a wide range of bioactivities with medicinal and agricultural interests such as antibiotic, antimycotic and insecticidal, nematicidal and antiulcer, antineoplastic and antiviral. It has been known that cultivation parameters are critical to the secondary metabolites produced by microorganisms. Even small changes in the culture medium may not only impact the quantity of certain compounds but also the general metabolic profile of microorganisms. Manipulating nutritional or environmental factors can promote the biosynthesis of secondary metabolites and thus facilitate the discovery of new natural products. This work was conducted to evaluate the influence of nutrition on the antibiotic production of X. bovienii YL002 and to optimize the medium to maximize its antibiotic production. Nutrition has high influence on the antibiotic production of X. bovienii YL002. Glycerol and soytone were identified as the best carbon and nitrogen sources that significantly affected the antibiotic production using one-factor-at-a-time approach. Response surface methodology (RSM) was applied to optimize the medium constituents (glycerol, soytone and minerals) for the antibiotic production of X. bovienii YL002. Higher antibiotic activity (337.5 U/mL) was obtained after optimization. The optimal levels of medium components were (g/L): glycerol 6.90, soytone 25.17, MgSO4·7H2O 1.57, (NH4)2SO4 2.55, KH2PO4 0.87, K2HPO4 1.11 and Na2SO4 1.81. An overall of 37.8% increase in the antibiotic activity of X. bovienii YL002 was obtained compared with that of the original medium. To the best of our knowledge, there are no reports on antibiotic production of X. boviebii by medium optimization using RSM. The results strongly support the use of RSM for medium optimization. The optimized medium not only resulted in a 37.8% increase of antibiotic activity, but also reduced the numbers of experiments. The chosen method of medium optimization was efficient, simple and less time consuming. This work will be useful for the development of X. bovienii cultivation process for efficient antibiotic production on a large scale, and for the development of more advanced control strategies on plant diseases. Xenorhabdus is a unique genus of bacteria, the species (strains) of which are symbiotically associated with entomopathogenic nematode belonging to the genus Steinernema. The primary (1°) forms of the bacteria are carried in the intestine of the infective dauer juvenile (IJ) developmental stage of the nematode. The IJ penetrates an insect host and releases the bacteria into the hemocoel of the host. The bacteria multiply rapidly and produce various metabolites which can overcome the insect immune system , kill the insect, and inhibit the growth of various fungal and bacterial competitors [2–4]. By doing so, the bacterial symbionts are believed to prevent putrefaction of the insect cadaver and establish conditions that favor the development of both the nematode and bacterial symbionts . The antimicrobial nature of metabolites produced by Xenorhabdus spp. is known, and several compounds with antibiotic activity have been isolated and identified. These include indoles , xenorhabdins , xenocoumacin , nematophin , benzylineacetone , xenortides and xenematide , and cyclolipopeptide . These metabolites not only have diverse chemical structures, but also have a wide range of bioactivities with medicinal and agricultural interests, such as antibiotic, antimycotic, insecticidal, nematicidal, antiulcer, antineoplastic and antiviral. X. bovienii has been known to produce two classes of antibiotics, indoles and dithiolopyrrolones (xenorhabdins, xenomins and xenorxides), which could inhibit the growth of Botrytis cinerea, Phytophthora capsici, and P. ultimum. X. bovienii strain A2 appears to be unique in the diversity of small-molecule antimicrobial compounds since four indoles, several xenorhabdins, xenomins and xenorxides have been isolated from this strain alone . These compounds showed strong activity against Gram-positive bacteria, yeast and many fungal species. It was concluded on the basis of in vitro tests that the antibiotics from X. bovienii may offer a good opportunity for the control of diseases caused by some species of plant pathogenic fungi. X. bovienii metabolites can suppress P. infestans on potato leaves with only slight phytotoxicity . The metabolites from X. bovienii exhibited 100% inhibition effect on P. cactorum lesions of pecan leaves . Similarly, we also found that the methanol extracted bioactive compounds from X. bovienii YL002 showed potent therapeutic and protective effects against B. cinerea on tomato plants and P. capsici on pepper plants . It has been known that cultivation parameters are critical to the secondary metabolites produced by microorganisms. Even small changes in the culture medium may not only impact the quantity of certain compounds but also the general metabolic profile of microorganisms . In particular, in the field of antibiotics, much effort was directed toward optimizing production rates and directing the product spectrum. Manipulating nutritional or environmental factors can promote the biosynthesis of secondary metabolites and thus facilitate the discovery of new natural products. Antibiotic production by Xenorhabdus spp. differs qualitatively and quantitatively depending on the strains and species of bacteria and their culture conditions. No antibiotic activity was detected, using an agar diffusion assay, from the metabolites of Xenorhabdus spp. cultured in 1% peptone water. However, other media have been used successfully for antibiotic production, including yeast extract broth and its modifications [2, 19], Luria-Bertani broth , sea water medium  and TSB [9, 10]. These results indicate that nutrition plays an important role in the onset and intensity of secondary metabolites, not only because limiting the supply of an essential nutrient is an effective means of restricting growth but also because the choice of limiting nutrient can have specific metabolic and regulatory effects . Recently, whole-genome sequencing programmes have revealed that the biosynthetic potential of microorganisms has been greatly underexplored, relying as it does on traditional approaches. In fact, the number of genes encoding biosynthetic enzymes in various bacteria including X. nematophila ATCC19061, the best studied strain of these bacterial symbionts, clearly outnumbers the known secondary metabolites of these organisms . The majority of these encoded molecules are cryptic. One reason for this observation might be that only a subset of biosynthetic pathway genes is expressed under standard laboratory culture conditions and therefore only a minority of potential chemical structures is produced. Most cryptic metabolite biosyntheses are tightly regulated, and are only activated under specific conditions. The methods to trigger biosynthetic pathways to yield cryptic natural products involve the culture conditions, external cues, co-cultivation and genomic approaches such as genome-mining, epigenetic remodeling, and engineered pathway activation . For example, altering easily accessible cultivation parameters, such as media composition, aeration, temperature or shape of culturing flask, can isolate hitherto unknown natural products from various fungi and actinomycetes . Therefore, to promote the biosynthesis of secondary metabolites and facilitate the discovery of new natural products, it is a prerequisite to design a proper production medium in an efficient fermentation process. Response surface methodology (RSM) is a commonly used method to find the optimal fermentation conditions for various microorganisms, and also an efficient statistical technique for optimization of multiple variables with minimum number of experiments [23–26]. The main advantage of RSM is the reduced number of experimental runs needed to provide sufficient information for statistically acceptable result. It is a faster and less cost method for gathering research result than the classical methods. The main aim of this work was to optimize the medium to maximize antibiotic production by X. bovienii YL002, a strain isolated from its nematode symbiont Steinernema sp YL002, which was obtained from the soil of Yangling, China. A stepwise optimization strategy was performed (1) screening the original medium; (2) selecting the best carbon and nitrogen sources that significantly affect antibiotic production using one-factor-at-a-time approach; (3) RSM optimization of these significant ingredients by central composite design (CCD). The different medium had significant effects on cell growth and antibiotic activity of X. bovienii YL002 (Figure 1). The modified PP3 broth (PP3+NaCl) showed a maximum antibiotic activity (250.0 U/mL), followed by YSG medium (245.0 U/mL), PP3 broth (235.0 U/mL), TSB medium (230.0 U/mL), LB medium (226.7 U/mL), modified nutrient broth (NB+NaCl) (210.0 U/mL), nutrient broth (NB) (190.0 U/mL) and YS medium (171.7 U/mL). The modified PP3 broth and YSG medium showed the similar antibiotic activity. In addition, YSG medium also showed the maximum DCW as compared with the others. 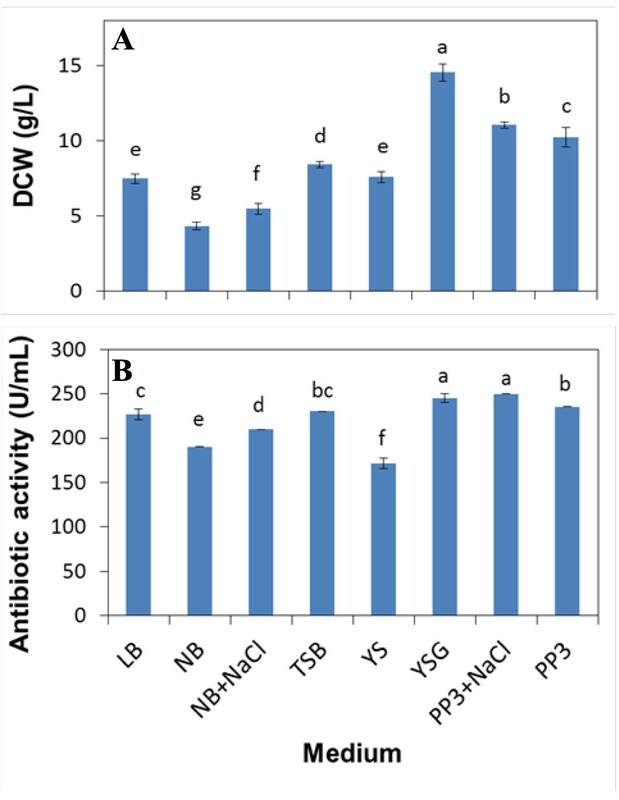 The effect of different media on DCW (A) and antibiotic activity (B) of Xenorhabdus bovienii YL002. YSG medium was the superior medium for higher antibiotic activity and biomass of X. bovienii YL002, which is in good agreement with previously reports which assert that YSG medium was able to support relatively high antibiotic production of Xenorhabdus spp. [19, 27]. Hence, YSG medium was employed as an original medium for the carbon and nitrogen sources selection studies. Osmolarity is an underlying physiological parameter which is associated with the virulence of bacteria . When osmolarity in the medium was increased by the addition of NaCl, X. bovienii YL002 drastically increased metabolite production, the antibiotic activity and DCW in PP3+NaCl and NB+NaCl are significant higher than that in PP3 and NB (Figure 1). Similar results were obtained when altering the osmolarity using NaCl, the metabolic profiles were significantly altered in X. nematophila. Increased osmotic stress by salt generally stimulated metabolite production in X. nematophila cultures . When osmolarity was altered by the addition of the solute sorbitol, X. nematophila cultures exhibited reduced metabolite production and poor growth characteristics . This reciprocal production profile suggests that osmolarity does contribute to the metabolic shift, which support the notion that hypoosmotic conditions were previously described to maintain a stable secondary form (2°) that does not produce antibiotics in rich medium . The carbon and nitrogen sources are the important constituents to be considered which are reported to have highly influence on the antibiotic production by Xenorhabdus spp. [27, 31, 32]. Based on YSG medium, the effect of various carbon and nitrogen sources on antibiotic activity of X. bovienii YL002 were studied by employing these at a final concentration of 5 g/L and 15 g/L for carbon and nitrogen sources, respectively. Results are presented in Figure 2. The results indicated that among the various carbon sources studied, the X. bovienii YL002 produced the maximum antibiotic activity in glycerol (246.7 U/mL). The antibiotic activity in glucose, fructose, maltose, sucrose, lactose and starch ranged from 153.3 to 160.0 U/mL. The antibiotic activity with the addition of crude carbon sources (corn flour) was 130.0 U/mL, and the minimum (123.3 U/mL) in bran. As for the various nitrogen sources, soytone (286.7 U/mL) and proteose peptone (276.7 U/mL) favored antibiotics production, and the antibiotic activity had no significant differences. Lower antibiotic activities were observed with urea and crude nitrogen sources (bean cake powder, cotton cake powder and fish meal). Thus, glycerol and soytone were chosen as the source of carbon and nitrogen for further experiments, respectively. Similar results were obtained in the study on the determination of the effect of various carbon sources and nitrogen sources on the antibiotic activity of Xenorhabdus sp. D43, maltose and glycerol had the strongest effect on antibiotic activity of the strain . However, previous study found that the optimal carbon sources and nitrogen sources for antibiotics production by X. nematophila BJ was glucose and soytone . For YL001 and TB strain of X. nematophila, the optimal carbon sources and nitrogen sources for antibiotics production was glucose and peptone [27, 33]. The disparity may be due to the use of different bacterial strains and different culture condition. It is also conceivable that the difference may be due to different original medium for carbon and nitrogen sources selection. 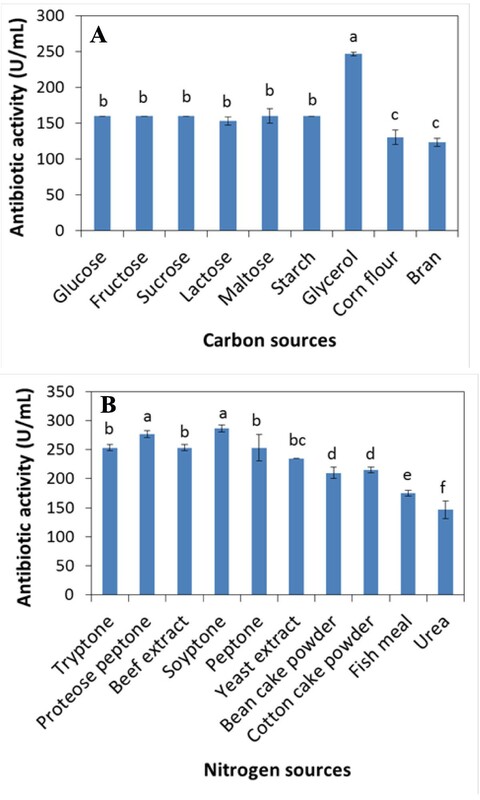 The effect of different carbon (A) and nitrogen (B) sources on antibiotic activity of Xenorhabdus bovienii YL002. It is known that several trace elements are essential for microbial growth because of their involvement in metalloenzymes or as enzyme activators. In secondary metabolism, zinc, iron and manganese are the most important trace elements . MgSO4, MgCl2, NaCl, KH2OP4, KNO3 and (NH4)2SO4 favored antibiotic production by Xenorhabdus sp. D43, but antibiotic production with the addition of Zn(NO3)2 and CuSO4 was found to be low . In YSG, the minerals contain MgSO4, (NH4)2SO4, KH2OP4, K2HOP4 and Na2SO4. Therefore, the minerals for further CCD design were defined as the total concentration of the minerals of YSG medium and kept the proportion of diversified components. Subsequently, experiments were conducted for further optimization of these selected nutrients employing RSM. After determination of carbon and nitrogen sources in the medium, the effects of concentration of medium constituents on the antibiotic activity with the producer YL002 were further investigated. The range and the levels of the variables investigated in this study are given in Table 1. A total of 20 experiments with different combination of glycerol, soytone, and minerals were performed, and the results of experimental for studying the effects of three independent variables, viz., glycerol, soytone, and minerals, on antibiotic activity are presented along with the observed and predicted response, which shows considerable variation in the antibiotic activity depending on the three independent variables in the medium (Table 2). Treatment run 1, 5, 9, 11 and 15-20 showed a high antibiotic activity (≥ 280 U/mL). The maximum antibiotic activity (305.0 U/mL) was achieved in run number 1, while the minimum antibiotic activity (230.0 U/mL) was observed in run number 14. Treatment runs 15-20 were the center points in the design, which were repeated six times for estimation of error. This result suggests that the data was deviated and the flask experiments were accurate. x i = coded value of the variable X i .
x1 = (Glucose - 5)/2; x2 = (Peptone - 15)/6; x3 = (Minerals - 6.2)/2. In order to evaluate the relationship between dependent and independent variables and to determine the maximum antibiotic activity production corresponding to the optimum levels of glycerol (X1), soytone (X2) and minerals (X3), a second-order polynomial model (Eq.2) was proposed to calculate the optimum levels of these variables. By applying the multiple regression analysis on experimental data, a second-order polynomial model in coded unit explains the role of each variable and their second-order interactions in antibiotic activity. Parameter estimates for factorial design experiments. Quadratic response surface regression designs are a hybrid type of design with characteristics of both polynomial regression designs and fractional factorial regression designs. Quadratic response surface regression designs contain all the same effects of polynomial regression designs to degree 2 and additionally the 2-way interaction effects of the predictor variables. Each effect could be estimate independently due to the orthogonal design. In order to evaluate influential factors/terms in the quadratic RSM, an ANOVA was established, and it can be seen from the degree of significance that the linear term of X1, X2 and X3 were significant at 5% level (Table 4). Among the linear terms, the main effects of glycerol and soytone on the antibiotics activity were highly significant as was evident from their respective P-values (P X 1 = 0.000224 and P X 2 = 0.000411). Minerals also had significant effect on the antibiotics activity at linear terms (P X 3 < 0.007216). Partial eta squared was used as a measure of effect size. Glycerol had highest impact on the antibiotics production as given by highest linear partial eta squared (0.758851), followed by soytone (0.728744) and minerals (0.530603). The result also could be explained by the Pareto chart of effects (Figure 3). The Pareto chart shows each of the estimated effects, interactions and the standard error of each of the effects, which measures their sampling error. In the experimental design the Pareto chart is a Frequency Histogram that shows the amount of influence each factor has on the response in decreasing order, and often, a line going across the columns indicates how large an effect has to be (i.e., how long a column must be) to be statistically significant . Quadratic term of X12, X22 and X32 were significant at 5% level. The result also indicated that glycerol, soytone and minerals could act as limiting factors, and small variations in their values will considerably alter either growth rate or product formation rate or both. Interactive terms of X2X3 were also significant at 5% level. The interaction between soytone and minerals had significant effects on the antibiotics production (P X 2X 3 < 0.026581). These suggest that the concentrations of glycerol, soytone and minerals have a direct relationship with the antibiotic activity in this particular complex medium. The result fitted in the previous work, in which glycerol, soytone and minerals influence bacterial growth and antibiotic production [27, 31–33]. Pareto chart of t -values for coefficients. The significance of each coefficient in this study was determined by Student's t-test and P-value. The larger the magnitude of t-test and smaller the P-value, the more significant is the corresponding coefficient. The positive coefficients for X1, X2 and X3 indicate a linear effect to increase antibiotic activity. The negative coefficient for X12, X22and X32 showed negative effects on the antibiotics production, indicating that the antibiotics production increased as the level of these factors increased and decreased as the level of these parameters increased above certain values. The results of the second-order response surface model in the form of analysis of variance (ANOVA) are given in Table 5. The ANOVA of the quadratic regression model demonstrated that the model was highly significant, as was evident from the low P value of the Fisher's F-test (Fmodel, mean square regression/mean square residual = 21.52501, Pmodel > F = 0.000007]. Moreover, the computed F-value was much greater than the tabulated F-value (F0.01 (7, 12) = 4.64), indicating that the treatment differences were highly significant. This proved that the model equation as expressed in Eq. (4) provides a suitable model to describe the response of the experiment pertaining to antibiotic activity. The model also showed a statistically insignificant lack of fit, as is evident from the lower calculated F-value (0.843414) than the tabulated F-value (F0.01 (7, 5) = 10.5) even at the 0.01 confidence level. The model was found to be adequate for prediction within the range of variables employed. The goodness of fit of the model based on RSM can be checked by the coefficient of determination (R2), which provides a measure of how much variability in the observed response values can be explained by the experimental factors and their interactions. The R2 value is always between 0 and 1. The closer the R2 value is to 1.00, the stronger the model is and the better it predicts the response. In this case, the coefficient of determination R2 = 0.926233, which implied that antibiotic activity was attributed to the given independent variables. The R2 also indicated that only 7% of the total variations were not explained by the model. The value of the adjusted determination coefficient (adjusted R2 = 0.883203) was also high to indicate a high significance of the model. These measures indicated that the accuracy and general ability of the polynomial model was good and that analysis of the response trends using the model was reasonable. A higher value of the correlation coefficient, R = 0.96241, indicates a good agreement between the experimental and predicted values of antibiotic activity. These measures indicate that the accuracy and general ability of the polynomial model are good and that analysis of the response trends using the model is reasonable. R = Coefficient of correlation = 0.962410; R2 = Coefficient of determination = 0.926233; adjusted R2 = 0.883203. ** Significant at 1% level. A regression model can be used to predict future observations on the response Y (antibiotic activity) corresponding to particular values of the regress variables. In predicting new observations and in estimating the mean response at a given point, one must be careful about extrapolating beyond the region containing the original observations. It is very possible that a model that fits well in the region of the original data will no longer fit well outside the region. Figure 4A shows observed antibiotic activity (the response) versus those from the empirical model Eq. (2). Point above or below the diagonal line represented areas of over or under prediction. The figure proves that no significant violations of the model were found in the analysis, and the predicted data of the response from the empirical model is in agreement with the observed ones in the range of the operating variables. Residual diagnostics of the contour surface of the quadratic model. A) The predicted vs. observed by replicates of antibiotic activity of Xenorhabdus bovienii YL002. B) Normal probability of internally studentized residuals. C) Plot of internally studentized residuals vs. predicted response. Usually, it is necessary to check the fitted model to ensure that it provides an adequate approximation to the real system. Unless the model shows an adequate fit, proceeding with the investigation and optimization of the fitted response surface likely give poor or misleading results. The residuals from the least squares fit play an important role in judging model adequacy. The assumptions for randomness, normality and constant variances of the residuals are all verified by the normal probability plot and the residual plot. The normal plot of residuals is shown in Figure 4B, as the most important diagnostic for the model, the normal probability plot of the residuals, came up by default. A linear pattern demonstrated normality in the error term, i.e., there were no signs of any problems in our data. Figure 4C presents a plot of residuals versus the predicted response. The general impression is that the residuals scatter randomly on the display, suggesting that the variance of the original observation is constant for all values of Y. Both of the plots are satisfactory, so we conclude that the empirical model is adequate to describe the antibiotic activity by response surface. The 3D response surface and the 2D contour plots described by the regression model are drawn to illustrate the effects of the independent variables, and interactive effects of each independent variable on the response variables. The shape of the corresponding contour plots indicates whether the mutual interactions between the independent variables are significant or not. An elliptical nature of the contour plots indicates that the interactions between the independent variables were significant. From the 3D response surface plots and the corresponding contour plots, the optimal values of the independent variables and the corresponding response could be predicted, and the interaction between each independent variable pair could be understood. The maximum predicted value is indicated by the surface confined in the smallest ellipse in the contour diagram. 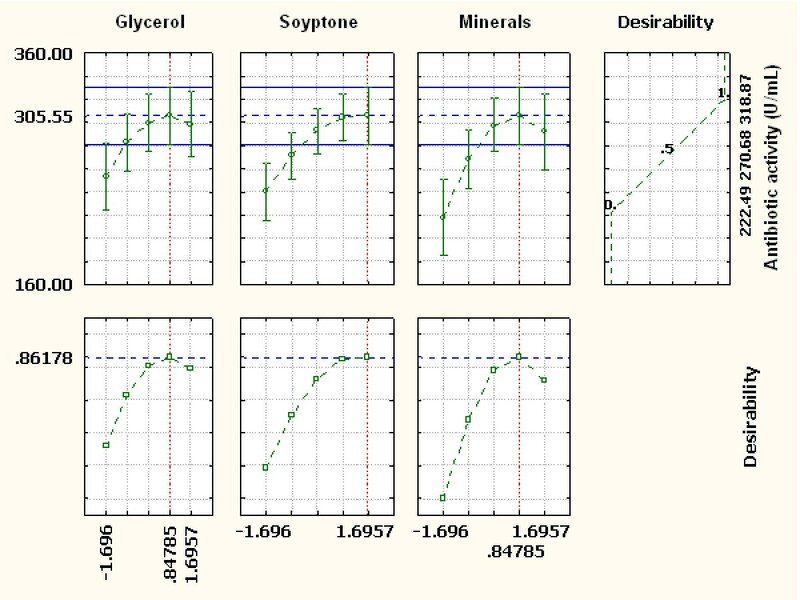 Figure 5A showed the 3D plot and its corresponding contour plot, showing the effects of glycerol and soytone on the antibiotic activity, while the minerals was fixed at its middle level. Glycerol has no significant interaction with soytone, which is evident from the relatively circular nature of the contour curves. With the increase of the concentration of soytone from 5.0 to 21.0 g/L (coded value -1.682 to 1.0), the antibiotic activity significantly increased from 199.16 to 253.58 U/mL at a low concentration of glycerol (-1.682), and increased from 254.91 to 292.44 U/mL at a high level of glycerol (1.682). When the concentration of glycerol was near 7.0 g/L (1.0), increasing the concentration of soytone from 5.0 to 21.0 g/L to some extent favored the accumulation of antibiotic, and any further increase in its values resulted in decreased antibiotic activity. Also, When the concentration of soytone was near 21.0 g/L (1.0), increasing the concentration of glycerol from 1.0 to 7.0 g/L (coded value -1.682 to 1.0) to some extent favored the accumulation of antibiotic, and any further increase in its values resulted in decreased antibiotic activity. The three-dimensional plot and its respective contour plot facilitated the identification of the optimum levels of glycerol and soytone. The analysis of Figure 5A reveals that the optimal concentration of glycerol was around 7.0 g/L, and the concentration of soytone was around 21.0 g/L. Response surface plot and contour plot. A) The combined effects of glycerol and soytone on the antibiotic activity of Xenorhabdus bovienii YL002. B) The combined effects of glycerol and minerals on the antibiotic activity of X. bovienii YL002. C) The combined effects of soytone and minerals on the antibiotic activity of X. bovienii YL002. 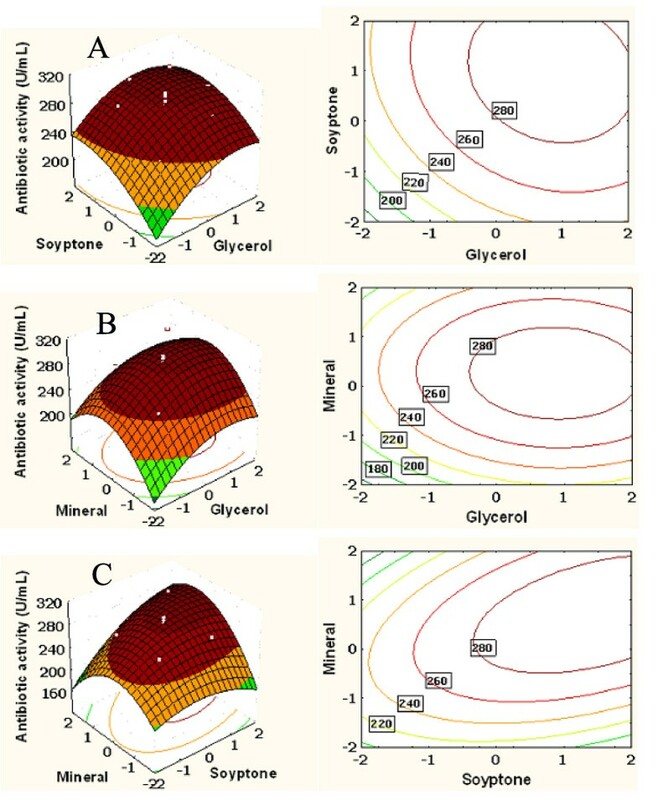 Figure 5B depicts the 3D plot and its corresponding contour plot showing the effects of glycerol and minerals on the antibiotic activity, while the soytone were fixed at its middle level. There was insignificant mutual interaction between glycerol and minerals, which is also evident from the relatively circular nature of the contour curves. When the concentration of glycerol was near 7.0 g/L (1.0), increasing the concentration of minerals from 3.0 to 6.7 g/L (-1.682 to 0.25) to some extent favored the accumulation of antibiotic, the antibiotic activity increased from 240.68 to 279.43 U/mL, and any further increase in its values resulted in decreased antibiotic activity. With the increase of the concentration of minerals from 3.0 g/L to 6.7 g/L, the antibiotic activity significantly increased from 195.08 to 246.03 U/mL at a low concentration of glycerol (-1.682), and increased from 234.16 to 291.21 U/mL at a high level of glycerol (1.682). The analysis of Figure 5B reveals that the optimal concentration of minerals was around 6.7 g/L. Figure 5C presents 3D plot and its corresponding contour plot showing the effects of soytone and minerals on the antibiotic activity, while the concentration of glycerol was fixed at its middle level. There was a significant mutual interaction between soytone and minerals. Under the moderate concentration of minerals, the antibiotic activity increased with increasing the concentration of soytone from 5.0 to 21.0 g/L (coded value -1.682 to 1.0), and any further increase in its values resulted in decreased antibiotic activity. At a high level of minerals (1.682), the antibiotic activity steadily increased when increasing the concentration of soytone. However, no significant effect of the concentration of soytone on antibiotic activity was observed at a lower level of minerals. The desirability function to obtain an optimum antibiotic activity was fitted by the least square method assigning the antibiotic activity at the observed low (222.49 U/mL) and high (318.87 U/mL) values for a corresponding desirability of 0 and 1, respectively, and the profiles were plotted using Response Surface Regression in STATISTICA 8.0 software. These desirability profiles show which levels of predictor (X1, X2 and X3) variables produce the most desirable predicted responses on the dependent variable (Y). The profiles for predicted response and the desirability level for factors (Figure 6) indicate that glycerol 6.9 g/L, soytone 25.17 g/L and mineral 7.9 g/L (the minerals were translated into the different components of YSG minerals according to the proportion. The values (MgSO4·7H2O 1.57 g, (NH4)2SO4 2.55 g, KH2PO4 0.87 g, K2HPO4 1.11 g, Na2SO4 1.81 g) give optimum antibiotic activity at an optimum desirability score of 0.86178 (305.55 U/mL). These profiles suggest that an increase in the concentration of glycerol, soytone and mineral above the optimized levels will not increase the antibiotic activity significantly. The verification of the results using the optimized medium was accomplished by carrying out shake-flask experiments. The maximum antibiotic activity unit obtained experimentally was found to be 337.5 U/mL. This is obviously in close agreement with the model prediction (305.55 U/mL). As a result, the model developed was considered to be accurate and reliable for predicting the production of antibiotics by X. bovienii YL002. After optimization, the antibiotic activity was improved by 15.7% and 37.8%, compared with mean observed response and at zero level of all variables (291.7 U/mL) and YSG medium (245.0 U/mL). Desirability charts of variables for maximum response. Statistical optimization method for the fermentation process can overcome the limitations of classic empirical methods and was proved to be a powerful tool for the optimization of antibiotics production by X. bovienii YL002. In the present study, glycerol and soytone were identified as the most important components for enhancing antibiotic production by X. bovienii YL002, and then their optimal concentrations were obtained by using response surface methodology. It was shown that the RSM model was adequate to predict the optimization of antibiotic production. Under optimal condition, the predicted value of the antibiotic activity was increased to 305.55 U/mL. Validation experiments were also carried out to verify the availability and the accuracy of the models, and the results showed that the predict values agreed with the experimental values well. The optimization of the medium resulted not only in a 37.8% higher antibiotic activity than media previously cited in the literature but also in a reduction of constituents costs. The chosen method of optimization of conditions was efficient, simple and less time consuming. Furthermore, the information obtained is considered fundamental and useful for the development of X. bovienii YL002 cultivation process for efficient production of antibiotic on a large scale. Xenorhabdus bovienii YL002 was isolated from its nematode symbiont Steinernema sp. YL002 obtained from the soil from Yangling, China, and had been identified to be X. bovienii according to its morphological and molecular characteristics [36, 37]. The entomopathogenic nematode-symbiotic bacteria including X. bovienii have two phenotypic (previous name: phase) variants, called primary form (1°) and secondary form (2°). Only 1° exhibits a considerable antibiotic activity . X. bovienii YL002 was maintained on nutrient agar (NA) slants and subcultured monthly. The primary-secondary switch is spontaneous and in case of X. bovienii is irreversible. Consequently the laboratory cultures should be scored after recovering from the 20% glycerol suspension in which they had been stored in the deep freezer. To ensure the predominance of 1° population, refrozen cells were seeded on the surface of NA media supplemented with 0.04% triphenyltetrazolium chloride (w/v) and 0.025% bromothymol blue (w/v) (NBTA), and fresh liquid culture were started from single blue (1°) colonies as described . Seed culture for antibiotic production was prepared by inoculating a loopful of phase I X. bovienii YL002 from a 72 h culture growing on an NBTA plate into a 250 mL flask containing 50 mL fresh YSG medium (glycerol 5 g/L, yeast extract 15 g/L, 1 M MgSO4 5 mL, (NH4)2SO4 2 g/L, 1 M KH2OP4 5 mL, 1 M K2HOP4 5 mL and 1 M Na2SO4 10 mL) , which was used in all seeding experiments. Media were adjusted to a final pH of 7.0 with 1 M NaOH solution to provide optimal condition of growth for X. bovienii YL002. The flasks were incubated in the dark at 28°C on an Eberbach rotary shaker at 150 rpm for 18-24 h until the optical density (600 nm) and pH readings were approximately 2.0 and 7.0, respectively. Antibiotic activity was measured by agar diffusion plate assay with Bacillus subtilis. Briefly, 1 mL containing 107-108 colonies of B. subtilis was applied to NA plate. After 2 h incubation at room temperature, the supernatants of culture following microfilteration (100 μL), using a 0.22 μm syringe microfilter, were placed on 6-mm disk filters (Whatman 3-mm paper) and air dried. The dried disks were put on the NA plate and incubated at 28°C for 24 h to determine the relationship between the size of the zones of inhibited bacterial growth and the concentration of the antibiotic. Zones of inhibition were measured, and measurements were taken from the edge of antibiotic disk to the margin of the zone of inhibition. Antibiotic activity was expressed as units of activity per milliliter the supernatants of culture, where 1 U was defined as a 1.0 mm annular clearing around the antibiotic disk. Maxwell et al. confirmed the assumption that the changes in the size of the zones of inhibition (expressed as units of activity per gram of insect tissue) represented changes in antibiotic concentration; the antibiotics were extracted from insect larvae killed by X. bovienii by homogenizing the insects in distilled water . The assumption has been used successfully to measure the antibiotic activity of X. nematophila YL001 . Therefore, the size of the zones of inhibition served as a measure of antibiotic titer of X. bovienii YL002. Cell growth was measured by optical density of the culture at 600 nm and biomass concentrations (DCW: g/L) were determined using a calibration curve. The calibration curve was calculated using dilutions of a biomass suspension with known optical density. A fixed volume of the dilutions was centrifuged (20 mins, 4°C at 22400 g, Himac CR 22G, Japan) and drying of the cell pellets at 110°C for 24 h. All the cell pellets were weighed before the centrifugation and after the drying. Thus, a relationship between biomass concentration (g/L) and optical density (600 nm) can be determined. Different media such as nutrient broth, modified nutrient broth (beef extract 3 g/L, peptone 5 g/L, NaCl 10 g/L), PP3 broth (proteose peptone 20 g/L), modified PP3 broth (proteose peptone 20 g/L, NaCl 10 g/L), LB (tryptone 10 g/L, yeast extract 5 g/L, NaCl 10 g/L), YS broth (yeast extract 5 g/L, (NH4)2SO4 5 g/L, MgSO4·7H2O 0.2 g/L, KH2PO4 0.5 g/L, K2HPO4 0.5 g/L), TSB (tryptone 17 g/L, soytone 3.0 g/L, glucose 2.5 g/L, NaCl 5.0 g/L) and YSG were used in comparative studies to find the optimal nutrient medium for antibiotic production. Five microlitter of the seed culture was transferred into 50 mL of different sterile medium in 500 mL flask. The flasks were incubated in the dark at 25°C on an rotary shaker at 150 rpm. Samples of ca. 3 mL were withdrawn each 6 h approximately. An amount of 1 mL aliquots of the fermentation broth were centrifuged (20 mins, 4°C at 26880 g, Himac CR 22G) to separate the bacteria cells from the supernatants. The supernatants were store at 4°C until required for use. In order to investigate the effect of the carbon and nitrogen sources on the antibiotic activity of X. bovienii YL002, the optimal nutrient medium for antibiotic production was employed as an original medium for the following optimization studies. Various simple and complex carbon and nitrogen sources (Figure 2) were used individually instead of the corresponding carbon and nitrogen sources in the optimal nutrient medium while other components were kept constant at original concentration, and the antibiotic activity was determined after 72 h of incubation at 25°C under shaking (150 rpm). where Y is the measured response, β 0 is the intercept term, β i , β ij , and β ii are the measures of the effects of variables x i , x i x j , and x2 i , respectively. The variable x i x j represents the first-order interaction between x i and x j (i < j). For the medium constituent optimization, a 23-factorial experimental design (CCD) for three independent variables each at five levels with four axial points and six replicates at the center points leading to a total number of twenty experiments was employed for the optimization of the medium constituents. The STATISTICA 8.0 software (StatSoft Inc. Tulsa, the USA) was used for regression and graphical analyses of the data obtained. The response variable was assigned at low and high of the observed values for a desirability of 0 and 1, respectively, to get the overall desirability. The desirability function to get the optimum combinations of independent variables was fitted by the least square method using the software. The 3D response graph and profile for predicted values and desirability level for factors were plotted using the same software. The statistical analysis of the model was performed in the form of analysis of variance (ANOVA). This analysis included the Fisher's F-test (overall model significance), its associated probability P(F), correlation coefficient R, and determination coefficient R 2 that measures the goodness of fit of regression model. 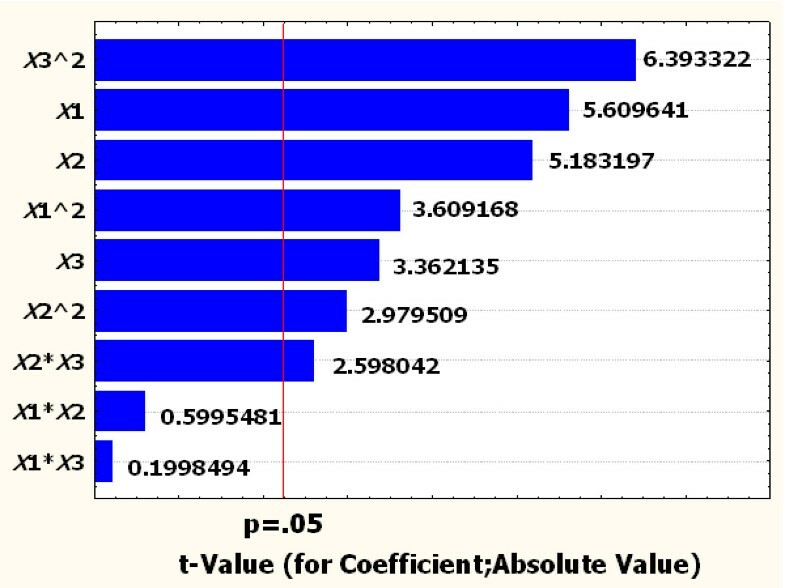 The analysis also included the Student's t-value for the estimated coefficients and associated probabilities, P(t). For each variable, the quadratic models were represented as contour plots. This work was supported by the Natural Science Foundation of China (No. 31171910), National Department Public Benefit Research Foundation of China (No. 200903052) and Young People Science Program of Northwest A & F University (No. 52211241). Yonghong Wang, Xiangling Fang contributed equally to this work. YW conceived, designed and organized the study. XF conducted the data analysis. YW and XF conducted the interpretation of results and drafted the manuscript. YW and XF contributed equally to this work as first authors. FA and GW carried out the experiments. XZ participated in critical reviews and improvement of the manuscript. All authors have read and approved the final manuscript.